The good thing about a travel blog is that you can go somewhere and not really like it. And this was the case when we went to Macau, a Special Administration Region (SAR) of China, just an hour ferry ride from Hong Kong. I had roped my sister and three friends to come with me on this day trip. We had arrived at the ferry terminal in Sheung Wan at 10am. Even though there was a ferry every 15-30 minutes, we were unable to get on a ferry until 12.15pm. This left us with two hours to kill in the worst terminal mall ever. There was a Starbucks, Pacific (Hong Kong’s Starbucks), Macdonald’s and numerous shops selling discounted designer handbags. Over an average coffee at Pacific, we read up on Macau. Known for its casinos of which none of us were particularly keen for, we were interested in the history, culture and food. 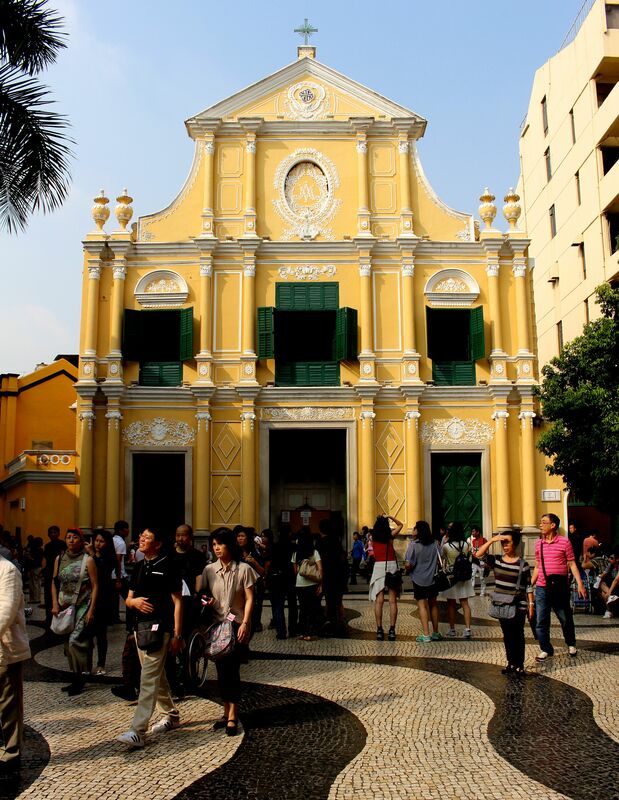 The Portuguese ruled Macau for over 400 years and we wanted to the see Senado Square, the historic town centre with churches, temples and other old buildings with distinctive European designs. 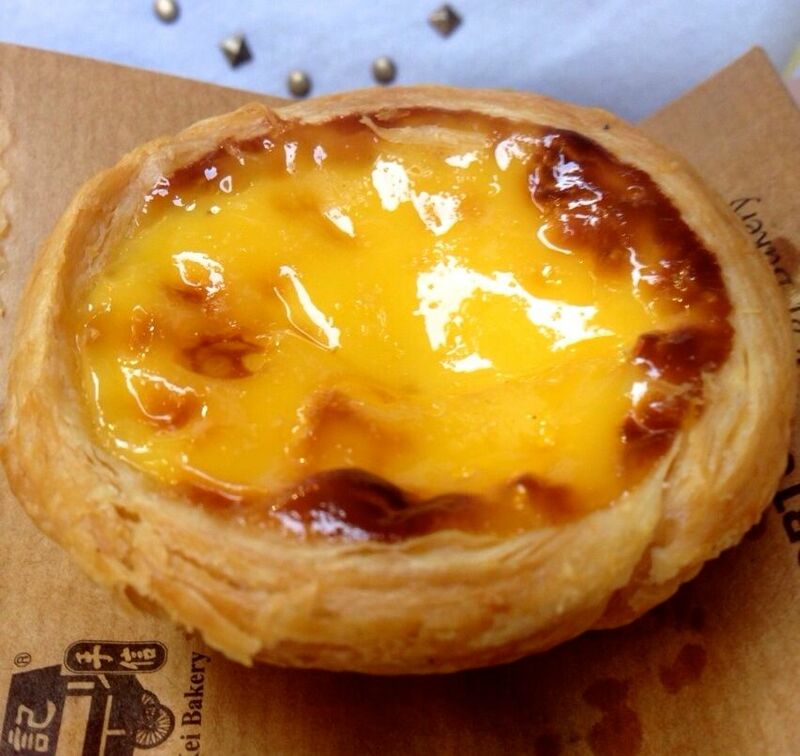 We were also interested in the cuisine, a fusion of Portuguese and Cantonese; in particular, we craved the Portuguese custard tart. Soon enough, the time passed and we made our way to the ferry. As Macau is a SAR like Hong Kong, we needed our passports. We pushed through customs and immigration until we got onto the ferry. Unfortunately, this wasn’t the kind of boat ride where you could hang out on the top deck, with the breeze in your hair, taking selfies. No, as this was a turbo jet (a super fast ferry), it was completely enclosed, and therefore a rather boring journey. On arrival, we were greeted with large, air conditioned coaches to take you to your hotel/casino. Bellboys were ready to assist you with your luggage. As we were not going to any hotel/casino, we took a local bus into town. We squeezed onto the no. 3. As we hit the road, the mix mesh of cultural influences was immediately obvious. There were European-style flower baskets and lampposts which lined the streets. There were brands and shops that you would find in Hong Kong and there was a hint of Vietnam as motorbikes zipped through the streets Ho Chi-style. Twenty minutes or so later, we hit some traffic and we sensed that we were getting close. Soon, we spotted the square on our right and we hustled off the bus. Overflowing with tourists, the square featured mosaic flooring and pastel yellow and pink buildings. It was interesting but for anyone who has been to Europe, this will pale in comparison to the actual buildings in real Europe. Next, we tried to find a restaurant that was recommended for its authentic Macanese cuisine. Because we misjudged the scale of the map, we arrived just after 3pm and the restaurant was closed. Disaster! So we headed next door. They welcomed us but warned us of the renovations they were currently doing to half the shop. We were starving so we didn’t care. I ordered the Portuguese chicken which was a baked dish, served with rice, carrots, potatoes in a thin sweet curry sauce. We ate our meals to the sounds of hammering and drilling. Full from lunch, we power walked back to the town square. We were heading for St Paul’s ruins just north of the square. There remains a façade of the 16th century cathedral which overlooks the city. This is also a small museum of relics and treasures also from that era. 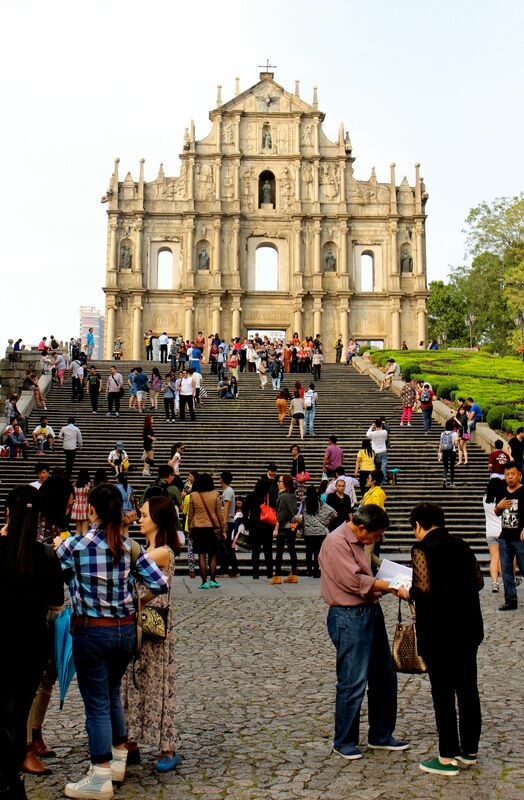 St Paul’s was the highlight of the Macau trip. The street leading up to the ruins is filled with vendors selling meat jerky and the Portuguese tart: a warm egg filling in a flaky pastry shell. We bought one each and it was delicious. Macau redeemed itself slightly. We had read that immigration in Macau could take up to two hours so we headed back to the terminal nice and early for our 7pm ferry back to Hong Kong. Of course there were no such lines on this day so we had another two hours to kill, in a ferry terminal that didn’t even have Pacific coffee.